Calvers is the cottage in the middle of the terrace of three. Like Grazers & Threshers it has its own front driveway with parking for two cars but internally it is quite different. To the left of the hall the kitchen/diner seats six with ease. To the right the long lounge has an open fire, a comfortable Parker Knoll suite and a 40” TV. 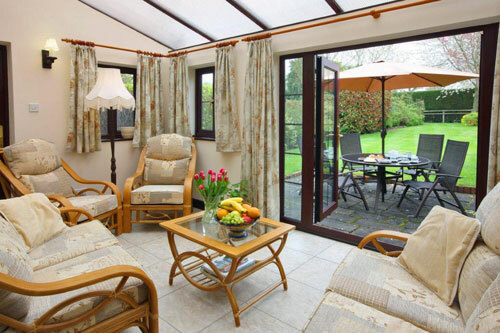 The lounge leads via french doors to the conservatory which is in the style of a garden room with solid walls and a translucent roof, ideal for reading when the weather isn’t quite good enough to sit outside. Off the hall is a ground floor cloakroom with loo and washbasin. With wifi internet access. Upstairs is a bathroom plus three bedrooms, an en-suite double with TV, a twin and a single room (this single room has a hideaway bed so that it converts into small twin enabling the cottage to sleep six). To the rear of the cottage the patio, with furniture and a gas barbecue, is accessed through french doors from the conservatory. The lawn has shrubs on either side creating a private area and the garden is fenced all round so that it is totally secure. Very comfortable cottage. Good walking country. Enjoyed the coffee cake. Very comfy cottage, really appreciated welcome pack and cake. Lovely village and countryside. had a very relaxing stay - hope to return. Lovely, very comfortable home from home. Lovely walks and countryside. Enjoyed our stay very much. Enjoyed a very leisurely break. Cottage very comfortable and welcoming. Very enjoyable week with trips to Croft Castle, Powys Castle, Berrington Hall and of course Ludlow with its lovely shops market and castle! Lovely cottage, the week has gone far too quickly! Had a lovely break, very nice hosts, lovely cottage, ‘we’ll be back’. Third time here and again enjoyed a restful break. Welcome pack wonderful. Excellent cottage and very friendly village. We’ll be back again. Have been many times - always enjoyable. Another relaxing week here at Ashford Farm Cottages (5th visit). Always a pleasure to return. No doubt will be back again to recharge our batteries! 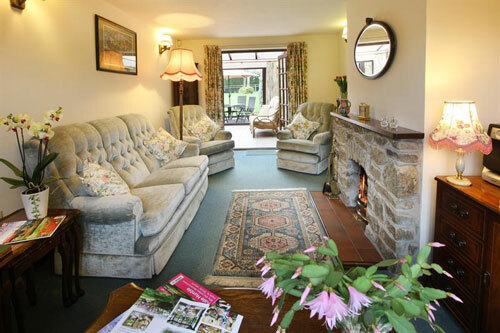 Thank you for a very comfortable and enjoyable stay, the cottage is so well equipped. Hope to be back in the very near future. Hey Ho the wind and the rain . . . . A fine place, fine food, beautiful landscape, charming people . . . we will be back for sure. What a delightful cottage and lovely area. Made a great base to stay for a family wedding. Will hope to come again. We have stayed in this cottage many times and always enjoy a very relaxing holiday. A fabulous experience. An entirely marvellous little cottage with lots and lots of amenities. We particularly enjoyed the lovely garden. We look forward to returning. Ashford Farm Cottages still delight me. A wonderful week. Thank you for the goodies. 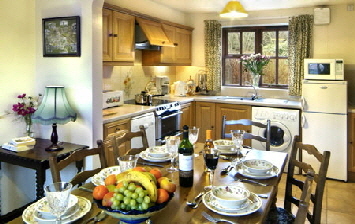 Very homely cottage in beautiful countryside. Enjoyed the thoughtful ‘welcome pack’. Also aware of the friendly nature of the villagers. Above all, the peace and quite was a pleasant surprise to the city dwellers. Houston family, Dumfries & Galloway. Lovely relaxing break in this delightful cottage. Super village and everyone so friendly! Thank you for the welcome pack, much appreciated. Second visit. Lovely cottage, very cosy, warm and quiet.